(Phys.org)—A team of researchers from Google, the University of the Basque Country, the University of California and IKERBASQUE, Basque Foundation for Science has devised a means for combining the two leading ideas for creating a quantum computer in one machine, offering a possible means for learning more about how to create a true quantum computer sometime in the future. They have published the details in the journal Nature. Computer scientists would really like to figure out how to build a true quantum computer—doing so would allow for solving problems that are simply unsolvable on conventional machines. But, unfortunately, the idea behind such a computer is still mostly theoretical. To move some of the ideas from theory to reality, the researchers with this new effort have built an actual machine that is based on two of the strongest approaches to building a quantum computer. The first approach is based on the gate model, where qubits are linked together to form primitive circuits that together form quantum logic gates. In such an arrangement, each logic gate is capable of performing one specific type of operation. Thus, to make use of such a computer, each of the logic gates must be programmed ahead of time to carry out certain tasks. With the second approach the qubits do not interact, instead they are kept at a ground state where they are then caused to evolve into a system capable of solving a particular problem. The result is known as an adiabatic machine—some have actually been built because they are more versatile than the gate model computers. Unfortunately, they are also not expected to be able to ever fully make use of the full power of quantum computing. In this new effort, the researchers have attempted to gain the positive attributes of both approaches by creating a machine where they started with a standard quantum computer and then used it to simulate an adiabatic machine. It uses 9 qubits and has over 1,000 logic gates and allows for communication between qubits to be turned on and off at will. The end result, the team reports, is one that unlike an adiabatic machine, is able to tackle traditionally difficult computing problems. 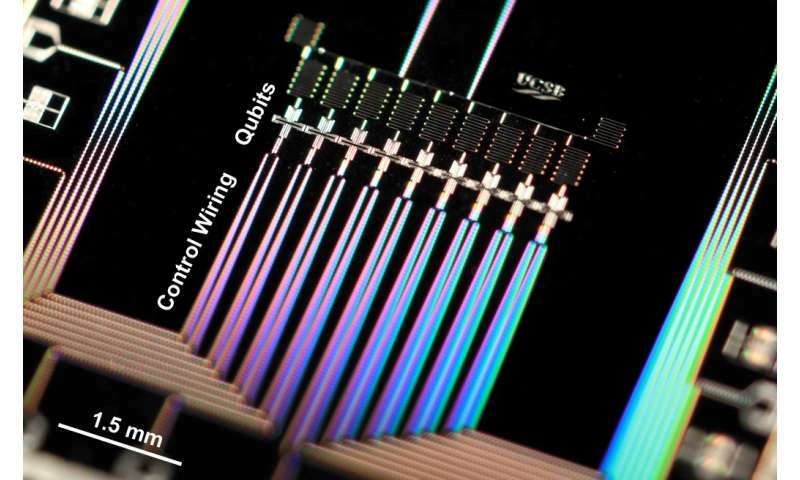 They expect it to be useful as a research tool, helping lead the way to the development of a truly quantum computer. Quantum mechanics can help to solve complex problems in physics and chemistry, provided they can be programmed in a physical device. In adiabatic quantum computing, a system is slowly evolved from the ground state of a simple initial Hamiltonian to a final Hamiltonian that encodes a computational problem. The appeal of this approach lies in the combination of simplicity and generality; in principle, any problem can be encoded. In practice, applications are restricted by limited connectivity, available interactions and noise. A complementary approach is digital quantum computing, which enables the construction of arbitrary interactions and is compatible with error correction, but uses quantum circuit algorithms that are problem-specific. Here we combine the advantages of both approaches by implementing digitized adiabatic quantum computing in a superconducting system. We tomographically probe the system during the digitized evolution and explore the scaling of errors with system size. We then let the full system find the solution to random instances of the one-dimensional Ising problem as well as problem Hamiltonians that involve more complex interactions. This digital quantum simulation of the adiabatic algorithm consists of up to nine qubits and up to 1,000 quantum logic gates. The demonstration of digitized adiabatic quantum computing in the solid state opens a path to synthesizing long-range correlations and solving complex computational problems. When combined with fault-tolerance, our approach becomes a general-purpose algorithm that is scalable.